What do you guys use to store your tools? Clearly "a toolbox" is a bit too simple an answer, otherwise I wouldn't have asked. I currently have a sizable for all my tools. My wood tools, my mechanical tools, my electrical tools, nails, screws, soldering iron, heat shrink, etc. It fits, barely, but isn't great. I'm considering moving my electronics stuff, which includes the RC hobby, really so a separate toolbox, and I'd like to get something that imposes some order. My current toolbox basically only has the box itself an a single tray. I've been considering the brief-case style toolboxes, but it would be interesting to hear what you have to say. 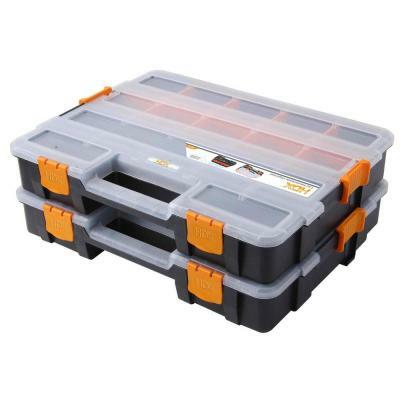 I use a plano tackle box like this. I keep electrical stuff, soldering gun and solder, heat shrink etc in a separate box. I have 5 different boxes 1 just for batteries, 1 for props, 1 for taking to the field as a crash/service box. It is all in what is comfortable and works for you. I use a modular setup that is easy to move and ready to go to events. I have another organizer like the one above with doors but with 4 sealed bins, like a plano box. It is good for electric props. and they are made to stack on an event table or shelf. This is the big box that everything gets put in and on for events. I don't use it too much in the shop. 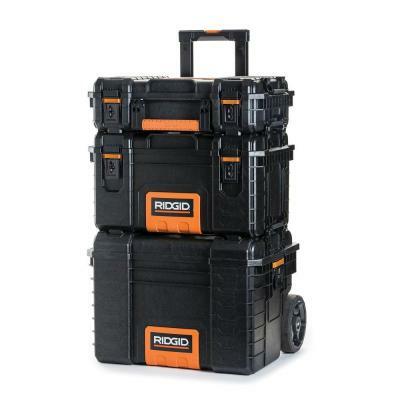 I am going with the RIDGID Pro Tool Box. It is a little expensive (each piece is sold separately) but a good size and of good construction. I currently have a Home Depot Bucket with Husky tool pouch bag that fits in. In the bucket I have carried around many of the small items in those plastic Crystal Light tube things. That was not a bad solution and it was certainly inexpensive. However I've been tossing out the tubes for a $3 plastic organized box from Harbor Freight Tools. Today I chucked almost all those tubes and replaced them with two of these boxes that have 7 large and 2 slim compartments. There are removeable separators that allow you to make larger compartments. I also found 100 small zip lock bags in the craft area at Walmart for $2 so I can, for example, have male 3.5mm bullet connectors in one baggie and the females in another and both in one compartment. I'll do the same with my XT-60's. I still might remove some stitching from the pouch to allow for other items. It works and it's cheap. In the end, I settled for a combination. They have very handy variable size compartments. I bring one of these with me to the field, containing extra props and some tools and zipties and what-not. The other stays at home for long-term storage. I can fit my batteries in there as well, in theory, though I'm not sure it's worth the squeeze. It's not a 100% solution yet. I still have my quadcopter, batteries and transmitter (and later fpv goggles) to consider, but currently I just stick that, along with the first box, into a backpack and go. It's only 4kg (8 lbs) and is about the size of a large briefcase, but narrower, when folded. I haven't had a chance to bring it out, yet, but I feel like it'll make setting up and changing props etc much easier. They are super affordable and of good quality. The plastic is not brittle and doesn't crack. The boxes are interlocking. I have 4 and lock them all together and can carry them with one hand. They also can fit into a book-bag for easier transporting. The dividers inside actually work and keep items contained. The upper half has removable sections so you can fit larger items like bigger props. I'd love something like this where ALL the dividers were removable, while maintaining stiffness. The latches on the side would help with the stiffness. I'd like to be able to use a box this size with custom foam insets. It may just be a question of finding the right search term in German. You wouldn't believe the things that are hiding on amazon provided your search-fu is strong enough. (I live in Germany, but I'm not from Germany, and speak relatively little German). You say that they're stackable; do you mean that they lock in to each other as well, or do they just fit on top of each other? I have a "Husky" 15 drawer tool chest in my basement shop, a "Husky" 6 drawer rolling tool chest in my garage (doubles as a rolling workbench) and a Stanley Fat Max "Telescopic rolling work station" as my field box. I also have a plain old plastic tool box with a single tray for quick visits to the field. Holds my batteries and whatnot. 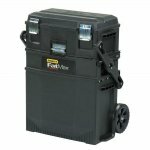 My "portable" toolbox is this one. 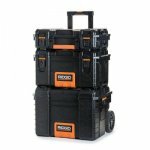 Man, I'd love to have things like "garage", "workshop" and "car"
I use one of those rolling Rigid brand modular cases as a field toolbox. 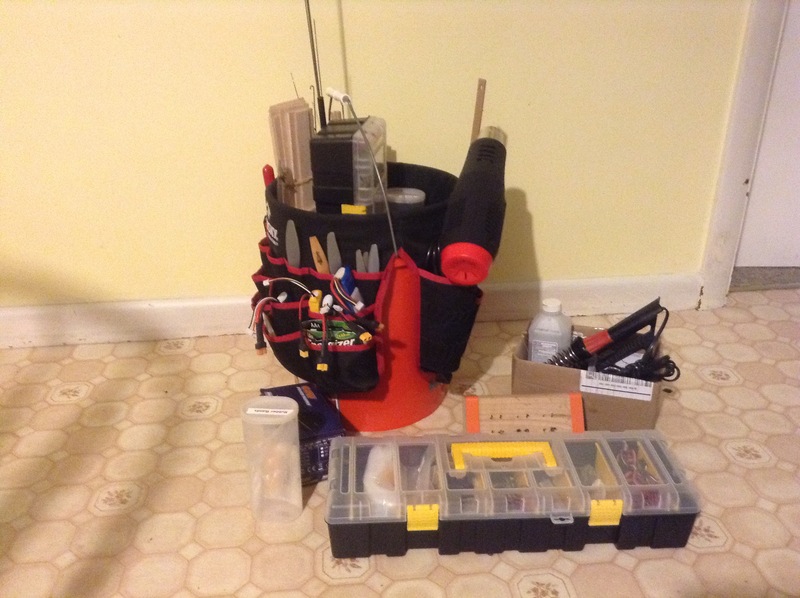 I actually only user the top section for tools, the larger boxes are for transmitters, cameras and other loose equipment. I have a mutant tool gene that makes almost any tool irresistible. I really need to do a good cleanup and get things reorganized with some additional shelving. RC building supplies seem to be trying to take over. The orange sliding latches on the side of the box locks into the box above it. I stack all of mine up, lock them together and carry all four with grabbing a handle in the middle. The basic issue is if one can carry with him (or her) the necessary supplies to keep flying. Obviously batteries for both aircraft and transmitter go without saying. Apart from that carry the things that address the most likely show stoppers (broken prop, cracked airframe, servo problems, wiring, etc). For a field kit this actually doesn't take up too much but I stick just about all my scratch build stuff together which means I have to organize; still do. I'm looking for that inexspensive set up that can be carried in one hand, is cheap, is well organized, doesn't cost much, is practical, and can be purchased by a frugal hobbyist. It's nice that it carries the transmitter too and also it should be economical.